Product prices and availability are accurate as of 2019-04-17 12:45:17 UTC and are subject to change. Any price and availability information displayed on http://www.amazon.ca/ at the time of purchase will apply to the purchase of this product. CLASSIC DESIGN: This elegant and beautiful display case is constructed of premium PU leather and with elegant contrast stitching for a classic and attractive appearance that makes a great decorative accent. MULTIPLE COMPARTMENTS: Whether you're an avid collector or just starting your collection this watch box features multiple pillow lined compartments that preserve the life of your watches and make them easy to find. FRAMED GLASS LID: Why not show off your watches to family and friends, with this watch box that features a framed glass lid to display your beautiful collection and doubles as an artistic statement piece. STURDY & SECURE LOCK: Keep prying hands away from your prized possessions. Our watch box features a sturdy lock that keeps your watches safe & keeps them from falling out and shattering if the box falls. MAKES A GREAT GIFT: Know an avid watch collector or someone who is just starting? 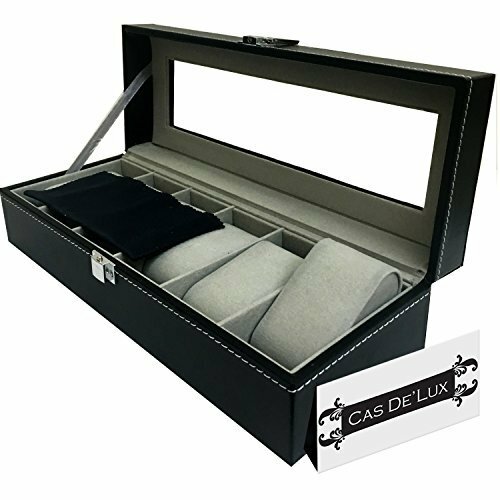 Gift them with this beautiful watch box that is neutral, complements any decor and will preserve the life of their watches.